The Utah Utes appeared to have a solid PAC-12 road win over the Oregon State Beavers on Thursday night in Corvallis, until committing an awful foul with 0.1 seconds left on the clock. 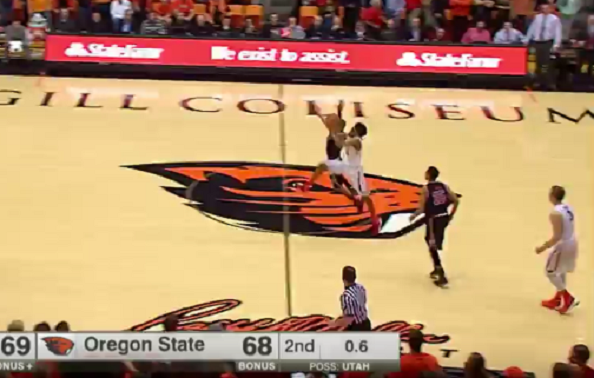 Trailing 69-68, Oregon State freshman guard Stephen Thompson Jr. attempted a desperation shot from half-court before the buzzer, and was bailed out on a foul by Utah senior guard Brandon Taylor. Thompson would hit all three free throws, giving Oregon State a stunning 71-69 win. So, there were six free throws taken, and two foolish fouls committed, in the game’s final 2.2 seconds.